In most people’s thinking, being in a small padded room would not be a good thing. But to voiceover artists, such as the incomparable Mel Blanc of Warner Brothers’ Looney Tunes fame, such a room is the best place on earth. A friend of mine was one of Blanc’s daughter’s childhood friends. She told me how she once had a whole conversation with Bugs Bunny while sitting in the Blancs’ living room. She was one of the few people who would have recognized the man behind the voice known around the world. While voiceover work has existed for decades, new technologies have enabled voiceover actors to record with more quality and to do so virtually anywhere." I grew up in Chicago listening to Larry Lujack on WLS and probably would have never recognized him had I run into him on the street. That’s the way voiceover is: People seldom think about who is behind the microphone; they just enjoy what they hear. Today, that’s true as ever as voiceover, like with other entertainment industries, has moved into digital. While voiceover work has existed for decades, new technologies have enabled voiceover actors to record with more quality and to do so virtually anywhere they happen to be. This growing need for voiceover work, along with the opportunities to work from anywhere, make this profession a great and burgeoning business for voice actors. The keys to getting started as a voiceover actor are first to find connections and second, get a demo out there. A few years ago, I was cast as the lead in a film called, “The Bill Collector,” and there I met the gifted actress, Kera O’Bryon. She happens to be one of the top voiceover talents in the nation. So I asked her if she would help me get started in voiceover, and she graciously did. Her immediate advice was that I first needed to make a voiceover demo recording, usually in MP3 format. This demo is like an actor’s headshot for opening the doors. These demos can cost a great deal of money; however, I hit up a buddy of mine who owns his own recording studio, Gary Emory at Brightwater Digital Studios. Once you get started, there are ways to help yourself climb the ladder. 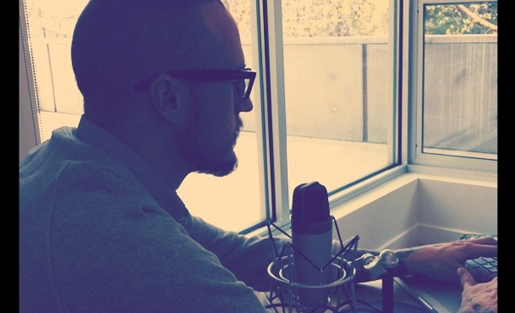 Below are five tips and tools to help the voiceover actor succeed in the digital age. One great advantage of the new digital technologies is that you can do a lot of the work at home with your own private recording studio — no special wardrobe, no makeup. I have a little office in my basement that I converted to my home studio. I suggest getting some advice from the pros at East West Audio Body Shop, and get some great gear at Harlan Hogan’s. When a voiceover artist travels she needs to take a portable studio with her to keep up with the voiceover work that comes in. 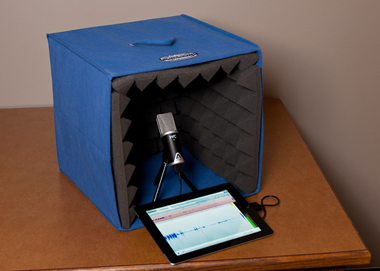 I have Hogan’s great Port-A-Booth and have recently bought an iPad, downloaded the Twisted Wave App, and added an Apogee Digital Microphone that plugs into an iPad or iPhone directly. I have always made back the money I invest into making my home or portable studio better. So keep on the lookout for more equipment to upgrade your rig. As in acting, it really helps to make friends in the voiceover world. I have local friends like Lisa Biggs with Voxy Ladies who I can go to if I need help or want to run an audition past her before I send it in. Sometimes when your equipment isn’t working or it’s too noisy at your home with your neighbor’s leaf blower going, you need to record somewhere else and a local voiceover friend can really help. There are several voiceover get-togethers that a voice artist can attend. In this picture, I’m the one on the far right, attending That’s Voice Over in New York with my friend Lisa. 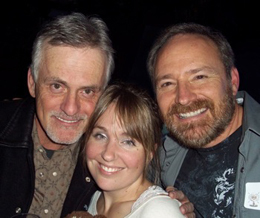 On the far left is the famous Rob Paulsen, who has voiced Pinky of “Pinky and the Brain” and Carl Wheezer in “The Adventures of Jimmy Neutron: Boy Genius” — just to name a few of his many voiceover gigs. Since my voice is my instrument, I need to be careful taking care of it. Those nasty head colds can really cost me money now. Recently, I had to get some instruction through Edge Studio when I was hired to do some very long narration. I was finding by the fourth hour of talking my voice was beginning to wane. In this digital age, I was able to Skype with a wonderful voiceover pro who gave me great advice to save my voice in long narrations. Voiceover artists who do Audiobooks, or other long narration, need special training so they don’t strain their voices talking over long periods of time. The Screen Actors Guild (SAG) Foundation on occasion provides informative webinars on taking care of your voice. The Vocal Health and Technique Live Streamed Event (see video, below) was especially helpful. SAG also has regular voiceover training at their Don LaFontaine voiceover studio. Update, Feb. 1, 2013: This story has been updated to include the VoiceWorld conference in Toronto. Gary Moore grew up in Chicago and now lives in South Carolina. Gary has voiced for companies like Colonial Life, Kraft, Arby’s, Lowes, Nestle, and even major government agencies like The Port Authority of New York City. Great advice Gary! I’ve been in the business for over 20 years but am studying with Lisa Biggs and Dan Friedman to keep up my chops ! This ia great. A detailed round up of the things you need to get started and keep going. Thank you. Thanks for this article! I’ve found a great way to connect with fellow voiceover artists and producers is LinkedIn. This article was shared by Audiblescripts Audition Studio, a casting company I found through a LinkedIn group. There are several LinkedIn VO groups that provide helpful tips on just about any topic concerning the VO world e.g. home studio equipment, voicing techniques to eliminate clicks and smacks, P2P marketing and auditioning, etc. … The artists participating in these threads have either been through the grind and share their experience or they are just starting out and seek information. Several also write helpful blog posts on a regular basis and share them on LinkedIn so group members never miss out on an interesting post! Happy Voicing! I could not find a single voiceover group on linkedin. As a professional voice artist myself – at GregsTheVoice – I commend your article. Very true and pretty darn accurate. We appreciate the attention PBS is bringing to this profession! Kudos. This information is awesome thanks PBS! I’m a voiceover artist and I’m looking for work, got any suggestions of who to contact? I have a studio and can phone patch the session. I would do anything to be a VoiceOver actress but I’m not sure quite how to get started or what I should really do or who I should talk to to help me. Very informative! What sort of lines do you create for your tape? Do you make up your own voices or mimick characters you’ve heard? I’d love to try or be the VoiceOver for a book on ‘tape’. My name is Edmund Cole Andre’ ( nick: Eddie Nine, born with nine fingers among a plethora of additional physical challenges. ).Well that aside I finally get that I’m to do this ( voice work ) after close to 2000 folkes have made it a point to tell me. Actually this sounds like an exaggeration. It is not. I was on the air a couple of times with a pro ball player friend quite impromptu and the station’s talent ( 3 nationally known ) were quite shaken and threatened after hearing me. Job security I was later told. I want and need to begin the process and was told not to school, just to do it. Please, someone’s out there who may offer me something a bit more constructive. I would be so greatfull for any help . [email protected]. Thank you for the advice! I have always been told by friends and family to try voiceovers but I never took it seriously. Now, I’m thinking why not! I’ve always been interested in this. What I do is is watch my favorite anime/cartoon series and lower the volume and mimic their lines, but I’m unsure where to begin with this, where do I start, what type of demo do I make, who do I send it to, who to talk to, ect? Any help would be appreciated. This page http://freevoiceovercourse.com/ should help. I didn’t know where to start, too, so I did a little research and learned about the free access to voiceover training video series which really helped get me into the right mindset. I realized I had a lot to learn so I trained and received professional coaching and have been offered several roles already. They’re not really big projects but it’s a good start. And I know the best is yet to come. Good luck! The digital world presents many challenges for VO talents to succeed. However, with the right connections and the rigth mindset we should be able to succeed in what we do. I really need to get out of my UPS truck..
Great summary of how to get started! Awesome Article. I have done so much on my own and am at the point where I need to write and record my demos. Ideas? Suggestions? lots of people have told me what a great voice i have. how do i contact someone to get started with no money? These steps are the key to getting started in voice over. You can’t be a success unless you incorporate each of these elements. Ongoing training is a must! Good luck to everyone trying to break into this fun and exciting career! You want to make sure that your grammar and sentence structure is as professional as your business. Read your script out loud to help with proofreading. This also helps with timing your script. I have been told by several US people that my Welsh accent is “charming” and that i should put my voice to good use so would love to get the opportunity to break in to this business…would really appreciate some help and advice please ! Be extremely careful about companies who will “help” you. Too many out there will tell anyone they have a great voice and a great chance to get into the “Biz” then want you to pay thousands for training, recording demos, etc. Not that there aren’t legitimate places to learn and record, just do your research. Lots of people on the web willing to share their bad experiences.